Hosted or produced by Fennel Hudson, the Fennel's Priory podcasts feature life outdoors, often in the quiet corners of the countryside where we can escape the bustle of urban places. They celebrate nature connection, wildlife, seasonality, country living and outdoor pursuits. You can listen to the podcasts here, or via iTunes. 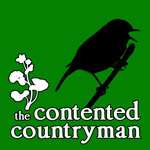 We're currently publishing The Contented Countryman podcast, but have others planned which will be added to our podcast family.